Japan's home to some pretty impressive shelf audio systems given the preponderance of well-mannered neighbors living side-by-side in tiny urban apartments. Today brings another, JVC's latest addition to its NX-TV series, the 15 x 15 watt NX-TC5. Unfortunately, while the unit sports an iPod dock and 4.3-inch LCD, video playback is limited to its integrated 1Seg digital TV tuner or WMV video stored on USB media -- not from Apple's beloved. 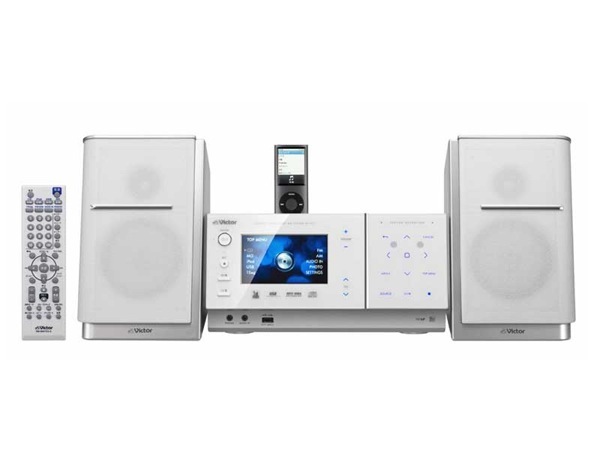 It does feature a swiveling front-panel for optimal viewing angle and motion-activated display in addition to 512MB of on-board storage for photos, an AM/FM tuner, and CD player with the ability to rip audio to MD or attached USB stick at 4x speeds. The TC5 is expected to hit Japan in late August for ¥62,000 (about $655) or ¥52,000 (about $549) as model NX-TC3 if you've finally kicked the MD habit. Looking pretty in white after the break.